Shriman Shrimati was a comedy television serial that was aired in the year 1994 on Doordarshan. The story line of the serial made it very poplar and a must watch for many people. The comic performance of the lead characters in the serial was loved by many, and it soon became one of the most popular and loved show on Doordarshan. Shriman Shrimati was based on the plot of love or likes for the neighbor’s wife. The serial showcases two neighbor families, where the husband tries to flirt and impress the wife of the other and vice versa. This serial was directed by the popular RajanWaghdhare. Shriman Shrimati was a comedy serial based on two families that were neighbor. 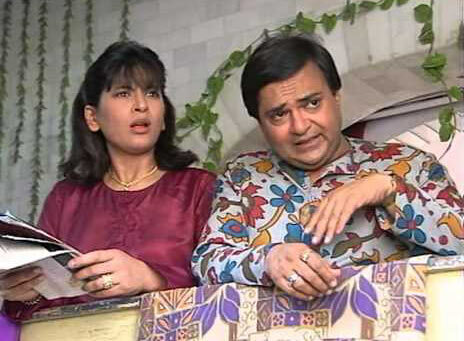 The main characters of the serial were Keshav Kulkarni who was married to Kokila and their neighbors were an actress, Prema Shalini and her husband Dilruba. Now Keshav is attracted to the famous and glamorous actress Prema Shalini and Dilruba likes the smart and elegant housewife Kokila. The main plot of the serial and each episode was that how the two husband try to flirt and impress, not their own, but the other one’s wife. The two men try their best to put the other one down and look better in front of the other one’s wife. Apart from these couples, there is another character in the serial, the son of Kokila and Keshav, Chintu. In India it is always said that one should always love your neighbors and treat them as your own family. But in this case, the two men of the serial seem to be very serious about this concept. More than their respective wives, they are awe for the other one’s wife. In each and every episode, the two men try their level best to woo the other one’s wife, but then fail. The portrayal of concept is done in an interesting and a highly comic way. The story is written in such a way that it makes you love the characters of the serial and then feel pity for the poor two husbands who fail to impress their neighbor lady miserably. The characters of the serial was just loved by the viewer, and many could relate to it. They were simple, but special in their own way. The actors of Shriman Shrimati gained a lot of popularity after this serial and gained a lot of praise for their character portrayals. Keshav Kulkarni- He is always flirting with his neighbor PremaJii and always has conflicting views with his wife, Kokila. He is also ever fighting with his son Chintu, his co-workers and PremaJii’s husband Dilruba. He keeps finding a chance to flirt with his neighbor PremaJii, and seeks for her attention all the time. Kokila Kulkarni- Kokila is wife to Keshav and is an elegant looking homemaker who thinks of Dilruba to be a great man. Prema Shalini- She is a popular Bollywood actress and is the glamorous type with an accent. She enjoys the attention that she gets from Keshav but loves her husband. She is a funny character. Dilruba- One just cannot stop loving the cute character Dilruba who is a husband to Prema and a homemaker. The way he flirts with Koki is just too adorable. Chintu- The mischievous son of Koki and Keshav, Chintu is cute funny and a well written character. His dialogs are amazing. Apart from this there is Gokhale who is colleague to Keshav, and is always advising Keshav for different things. Then there is Mr. Bablu who is the boss of Keshav and he always keeps scolding Keshav. Why viewers loved the serial? The constant love and fight of Koki and Keku (Keshav) was loved by viewers, they were funny and made people laugh their hearts out. The way Keshav made sarcastic comments on Dilruba, Ganagamausi and Chintu had to make people laugh and love him. The accent in her speech and the way Premajii reacted to situations and praises from Keku was hilarious. People love the way Dilruba flirted with Koki jii and the way Koki reacted to it. Friends are known to save you from trouble and to also get you in trouble. Gokaleis a perfect example for this. The conversation that Keshav has with Gokale is very engaging. Chintu was the reason enough for one to watch Shriman Srimati. Even though he did not appear in all the episodes, his dialogs and annoying behavior was something people waited for. The show justifies why one should love their neighbors, truly and in a funny way. There’s no doubt that viewers will be interested to view the serial even it re-telecasted.